Aha! I have your attention. You already know that I am a sucker for impressing palates at a dinner party, and my top secret is that I love doing so with minimal effort: implementing short-cuts and kitchen secrets. I feel like a criminal skulking through the shadows, knowing I am about to pounce---with well-accorded flavors---on the unsuspecting bystander. I feel spy-like in my guarded [and incomplete but painfully curious] knowledge of gastronomic short-cutting. It feels almost dishonest to impress guests with food that appears to have taken strategic planning, special imports or secret---kitchen---weaponry. But my kitchen-wide operation is to keep things more simple than suspected, to trounce with culinary surprises (and an occasional sabotage) to deliver bigger than expected flavors to otherwise innocent palates. I am stealth in my preparations, laying plans as far in advance as possible. I am always on the lookout for secret tips, tools of the trade and the next best recipe. The menu inspiration is this: I am increasingly impressed with the new trend in chips, my current new favorite being Terra's Sweet Potato and Beet Chips. Move over trans fats, hello low sodium, plus iron, fiber, calcium, Vitamins A & C. These are SO going in my children's lunch---and are worthy to tip off the front end of an American Bistro meal, simultaneously negating the singular place holder at Mexican meals of the classic chips and salsa. Add in some mixed olives and red wine and the meal has started. News from the bunker: I was sitting enjoying the food, too. The salad is one of my better kept, well-filed secrets: easy to make, lending itself to multiple lunches in the days that follow (the recipe will be coming soon to a blog near you). 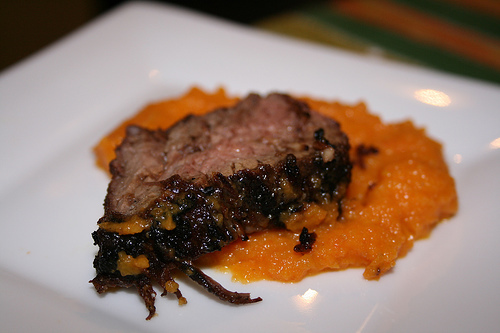 I was craving the steak and carrot puree, having made it just a few weeks ago, and knew that it was kid-friendly (considering: my kids and guests with kids) while at the same time guest-worthy. The dipping sauce that I pair with the bread is my secret handshake t0 taking the bread experience up a notch; during the meal we refilled the dipping bowl four times---bread loves to be noticed as would any four star general. I love roasted vegetables, and had potatoes and squash on hand. I lubed them with olive oil, salted them and threw them in the oven for half an hour at 400. Caramelized and delicious. The dessert was ice cream I made in my humble little Cuisinart Ice Cream Maker, and the orange brownies were compliments of a bake-it-yourself box from Trader Joes. A perfect vehicle for orange flavored ice cream. Menu inspiration is a strategic operation, involving selections that are complimentary yet personal, a consideration of color, balance of food [group] factions, food & drink alliances, and ideally balanced in preparation time and effort. A well planned menu packs a serious punch. I will not pretend to be an undercover five star chef, nor even a contender for Top Chef, and in fact somanybloggers blow me away with their regular portrayals of all things food. But I will say, I am happily armed if I have a spy-chest full of mouthwatering recipes, cocktail concoctions, unusual desserts and appetizers and families to come over who are ready to feast. Families whose life is commonly frantic and mission-oriented, who tend to eat food in the trenches: and whom adore slowing down if just for an evening, nestling into a meal that has been prepared just for them. And I myself rounding up the food, massaging miles of flavor, flirting with menus, making a lineup of my favorites and sitting back watching all my usual suspects enjoy a captain's table full of good food. Beware of skulking, self-proclaimed, undercover gourmands armed with hand-selected and adored recipes secretly lined up in soldier style to march upon your palate.